Description: Cutting Edge, 2012. 1st Edition. Fine/Near Fine. Gorillaland. Greg Cummings. Cutting Edge, 2012. First edition, first printing. Hardcover, 450 pages. Fine/Near Fine. Bright, clean and unmarked, as new other than tiny crease adjacent to base of spine on rear of jacket. 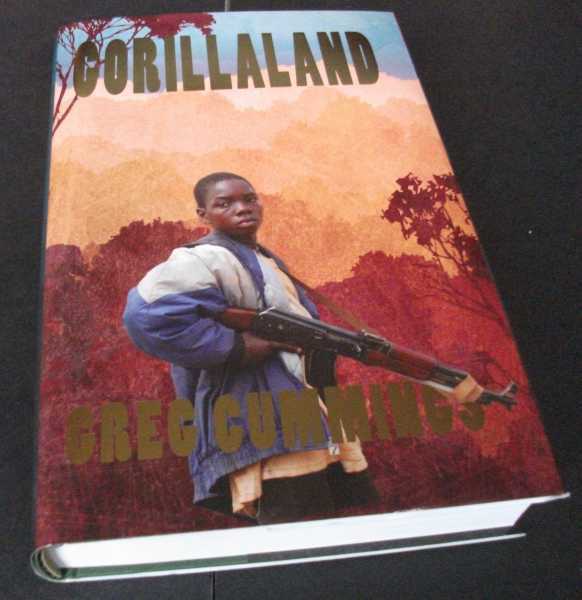 A cracking adventure yarn of kidnap, blood diamonds, civil war and ecological catastrophe set deep in the Congolese jungle. Derek Strangely runs a safari tour company with his side-kick Pedro, a Tutsi with a sad history. One day he stumbles upon a mauled child soldier and three large diamonds belonging to General Cosmo, who presides over the jungle, thwarting the efforts of UN peacekeepers. Hired by the mysterious diamond merchant, Katz, Derek and Pedro go into the jungle followed by the young and idealistic Natalie Cox who is determined to reveal Katz's illegal trade. Quantity Available: 1. Category: Fiction; ISBN: 1908122307. ISBN/EAN: 9781908122308. Inventory No: DSCF3312.